This remake of the classic 1930s­style rotary dial phone looks authentic on the outside while providing modern technology on the inside for your convenience. It accurately captures the look and feel of the old­time classic, making it a great feature in nostalgic and style­conscious surroundings. The original 1930s phone was made from heavy­duty metal, making it rather heavy and cumbersome. 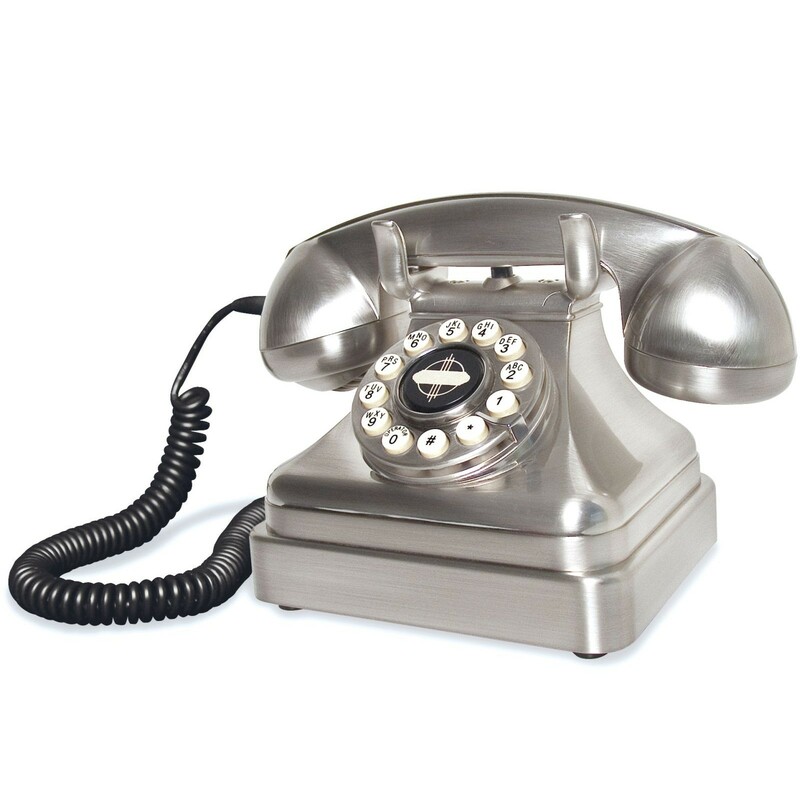 However, the Wild & Wolf Lobby phone has been reimagined in the form of high quality plastic with a classy chrome finish, making it both durable and lightweight while retaining its elegant curved design. In fitting with its 1930s­style design, the Wild & Wolf Lobby phone also sounds just as it should thanks to its bell ringer. While the Wild & Wolf Lobby Chrome definitely looks the part, blending in perfectly with a retro style, it is also essentially a modern corded phone providing you with convenience and ease of use. Instead of the original rotary dial, it provides push­button technology allowing you to make phone calls quickly. There is also a switch to turn the ringer on or off, a tone and pulse switch and a volume control for the earpiece. You can connect it to any standard BT phone socket. Combining an elegant and nostalgic style hiding modern technology within, the Wild & Wolf Lobby Chrome is a reimagined version of the 1930s classic, making it an ideal choice for those seeking something in fitting with an old­fashioned study, lobby or living room. I absolutley adore this phone! It looks great in my hallway and been the cause of more than a few adoring glances and inquiries as to where I got it!